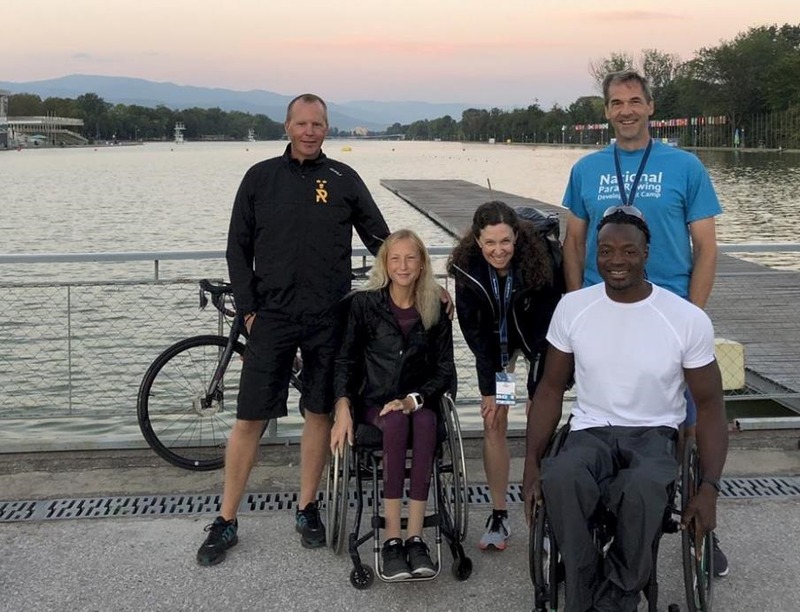 A big congratulations to Kingsley Ijomah of Marlow Rowing Club for his sterling performance at last week’s World Rowing Championships in Plovdiv, Bulgaria. I tend not to write about elite international competition because it tends to get plenty of coverage from British Rowing and the press. The focus of this website has been more on community adaptive and pararowing. Of course, those grassroots form the base of the pyramid for building a pipeline of awareness, interest, support and talent itself. And Kingsley is a superb example of the lattermost. I had the privilege of not just coaching Kingsley at this acme event, but also representing Nigeria here. 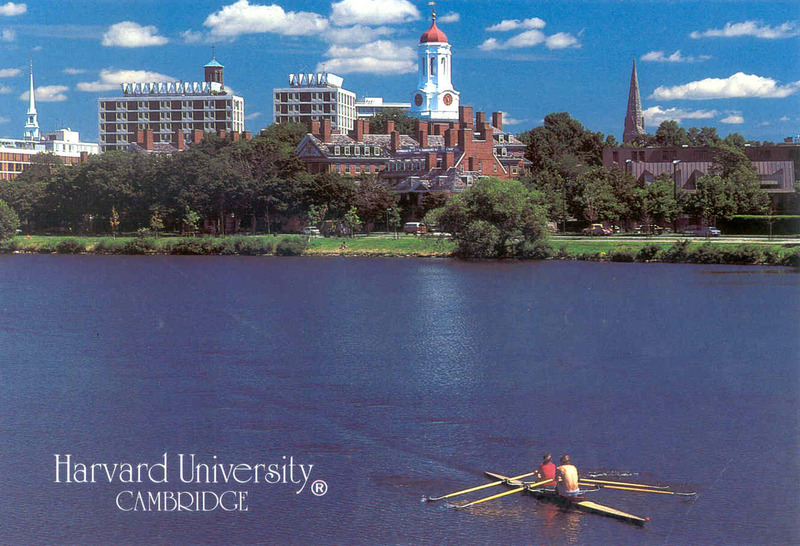 The connection takes me back to my younger university where I both learned to row and I took a year living in the West African country of Togo. Kingsley’s path the World Championships is a bit unconventional. 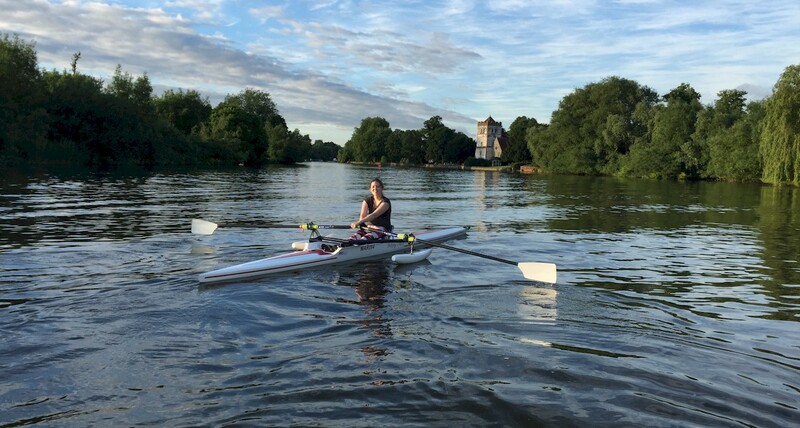 The typical path would be to develop as a pararower to the level that British Rowing’s Talent ID programme confirms your potential and invites you to be a part of its Development squad. The imprimatur of the national federation (British Rowing in the UK’s case) is required for any international FISA competitions (of course, you can travel to other ‘local’ competitions overseas if you like such as the Head of the Charles Regatta). In fact, Kingsley had been invited to the BR Development squad last year and participated in it for a number of months (as a resident of the UK since the age of 8 and someone expecting to naturalize imminently). But the Development Squad programme and requirements didn’t mesh well with his personal and work life, so he stepped down from it a while back. So how did Kingsley get to the World Championships? Well, it happens that he was born in Nigeria (which is also where he contracted polio). So, Kingsley applied to the Nigerian rowing body to row for their Nigerian rowing team. Someone making contact from thousands of miles away isn’t just handed a spot on the team so it took a little investigation by the Nigerian federation to determine whether Kingsley would be an appropriate addition, and in the end they invited him to row for the country. 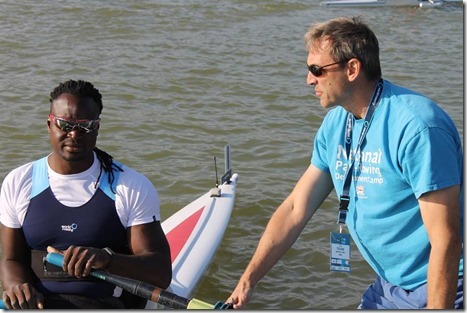 The first international competition for Kingsley to row under the Nigerian flag was Plovdiv. However, we were caught a little off-guard because we were invited by the Nigerian Pararowing federation and thought that they would provide the core support for all their rowers (eg. kit, support equipment), but at the last minute, they were unable to attend. So we were on our own as international novices. Payments – More of a Bulgaria destination issue (but World Rowing does hold a number of events at Plovdiv) is that they don’t take credit/debits cards in lots of places and they don’t have many cash points. Fortunately, things are very cheap and my 40 euros lasted me several days for incidentals (eg. drinks, coffees). Boat Weight – In FISA competitions, boats have a minimum weight. After you have won or placed in a race, the marshals take you directly from the landing stage to a boat weighing station. The minimum weight for a PR1 1x (with seat, riggers, streatchers and pontoons – basically anything firmly attached) is a 24kg. Kingsley’s WinTech Explorer 21 was a healthy 28+kgs. The Swift Racing and Filippi PR1 boats are considerably lighter. So much so that the para coaches were warned a number of times to ensure that they met weight provisions (and to make sure that any weight added to hit minimum weight was firmly attached to the boat). But it does seem like for international competition you should be looking at Swift or Filipi as studies have shown that every kilogram of extra weight in a boat can add up to 0.8 of a second over 2000m in an adaptive single (so Kingsley could have come in 2 places higher in the heats with that sort of time boost). Also, another adaptive coach told me that the Swift and Filippi sit a bit lower in the water giving the PR1 rower a more stable body position (not teetering so high) and more leverage on the blade. Blade Colours – All countries have specific blade colours (and in some cases elaborate designs like Argentina and New Zealand). We were counting on the Nigerian federation bringing the decals we needed, but in their absence, there was indeed a blade pavilion that was able to paint our blades to Nigeria design. All-In-One – Regulations also require that the rowers compete in all-in-one lycra in the country colours. Fortunately, since the Nigeria squad didn’t arrive with our kit, we were able to purchase a neutral coloured kit an secure a waiver from the umpires (but if you ever find yourself in this position, make sure you apply for this waiver the day before the race and don’t just show up with the request at the dock). Strap Visibility – On fixed seat boats, the straps have to contrast in colour with the athlete’s clothing. This provision is so that the marshals can ensure that the athlete is properly strapped in throughout the race. This issue is biggest when athletes (like Kingsley) wear the popular colour of black for the leggings and also have black straps. The solution was for Kingsley to lay a bright towel on his legs to create contrast (see photo at top). Quick Release Straps – This issue almost sunk the PR1 repechage racing and could have dramatic effects across the pararowing community. 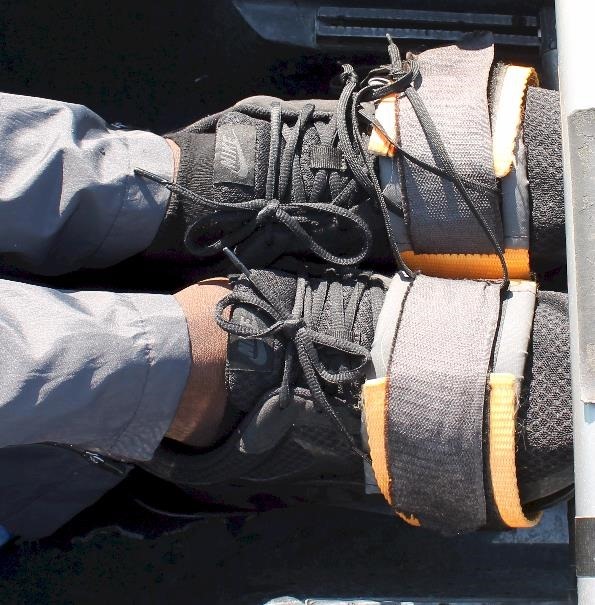 On the second day of racing, the boating marshal was all of a sudden checking the standard Velcro foot straps and saying “Those aren’t ‘quick release’. You’re not going on the water.” It’s not that the equipment was worn or broken. They were being used exactly as they came from the factory. But it turns out, Wintech is selling non-compliant equipment. The Velcro-foot straps provided are not “quick release” because there is not a single tab to pull to release them. In fact, to release them takes 4 actions (release left cover piece, release left attach piece, release right cover piece, release right attach piece). Fortunately, we had FISA Para Development Coach Jill Wuflinger (see photo below) at hand who had her handy knapsack packed with tools and bits and she was able to fashion quick release pulls out of laces for the boats missing them (see photo below). 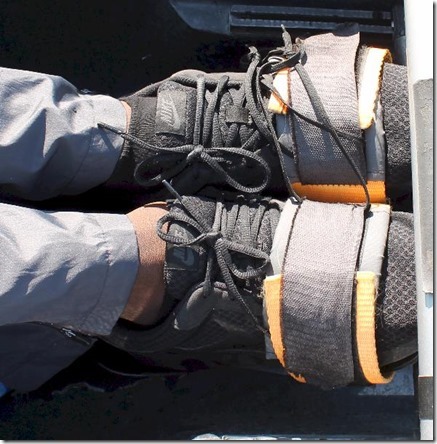 Methinks someone is going to have to address the issue of “quick release footstraps” in the pararowing community. Waterproofing Wintech Pontoons– With the blustery conditions, lots of water was splashing about and a good deal of it, over an extended period, was sloshing through the pontoon posts and getting into the pontoons adding weight to the boat. We would empty the pontoons after each session, but that didn’t help the weight being slowly added during the race. We significantly improved the situation by taping up the holes on the posts. John Tetly, of Croker Oars and former fellow Marlovian oarsman, told us that he used to just epoxy the post hole to close it up to keep the water from getting in (a job for our return home). Tape – Before I had departed for Plovdiv, I was wondering which tools to bring. In the end, I decided that it would be too difficult since I was travelling with just a carry-on bag (I would need to check a bag with the items like screwdrivers and scissors) and because I thought that the event would be full of vendors who could lend a few items. If I went again, I would recommend bringing a supply of tape (which came in handy a number of times). Online Video – FISA hosts a superb broadcast of all the racing on its website with expert commentary and live race information graphics (each athlete has a transponder attached to their boat which transmits boat position, speed, strokes per minute, etc). Unfortunately, the video is all live streamed and they only archive a few races (mostly the finals). So if you want to re-watch the race and hear the commentary, get a friend to capture/record the live stream. FISA support! – If this all sounds like too much, don’t worry. 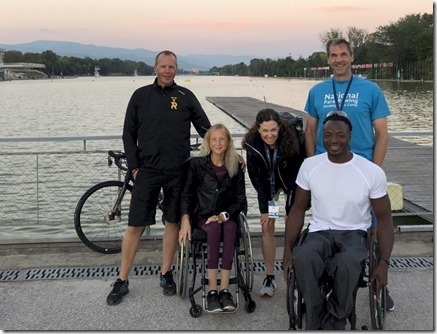 FISA has a couple of staff, namely Jill Wuflinger (see quick release heroics above) and Kanav Dosajh whose role is to support para-athletes from smaller and newer programmes. If you are reading this in a country who has a budding rowing programme and are considering entering the World Rowing Championships but are wary about the complexity and whether you have enough knowledge to do so successfully, rest assured that FISA is extremely helpful and supportive and keen to ensure that you have a great experience. Not to mention, the camaraderie with the other squads (para and non-para) is exceptional with people happy to lend a hand or tool or item (eg. thanks Sweden and FISA for the bike loans). Jill Wurflinger’s day-saving jury-rigged quick-release for the adaptive boat velcro foot straps. The entire African continent pararowing contingent with the entire Swedish pararowing population (Ebbe Einarsson is the only registered pararower in all of Sweden) with FISA coach Jill Wurflinger. 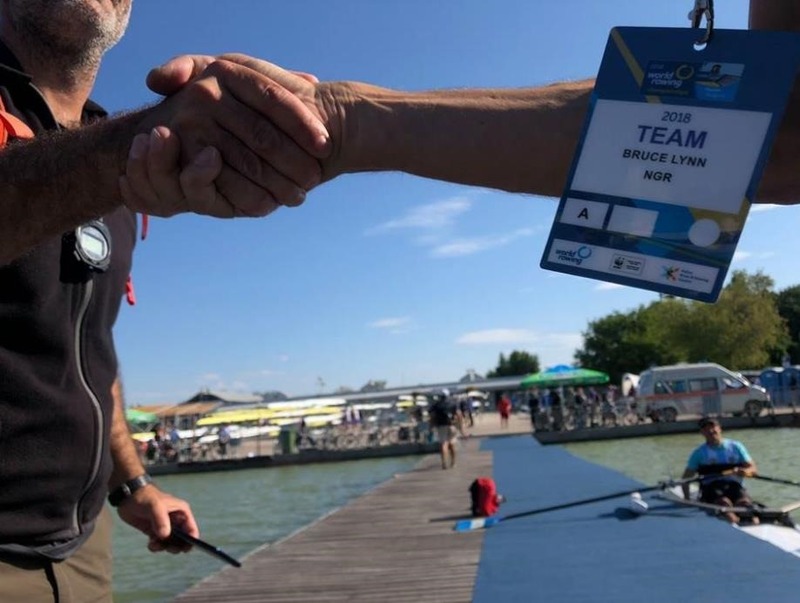 Not sure how this picture got taken, but an apropos shot of me and the Argentina coach congratulating each other (with Argentine rower in background) after one of the closest races all week with Kingsley pipping a place to the A/B Semi-Final by a bow ball.